LANSING, Mich. — Sen. Mike Shirkey testified before the House Health Policy Committee Wednesday on his bill to ease a Coldwater hospital’s upcoming merger. Senate Bill 450 would enable the Community Health Center (CHC) of Branch County to become a nonprofit entity and make the transition to ProMedica Health Systems more seamless. 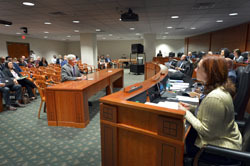 “If we do nothing, the CHC will become a new entity under the transaction and would need to once again take the many steps necessary to continue operation, such as re-acquiring all of their licenses, filing a new certificate of need with the state, enrolling with Medicare and Medicaid and other insurers as a new provider, and so on,” said Shirkey, R-Clarklake. Note: Click the image for a print-quality version. This photo and others are also available by selecting Photowire at right.